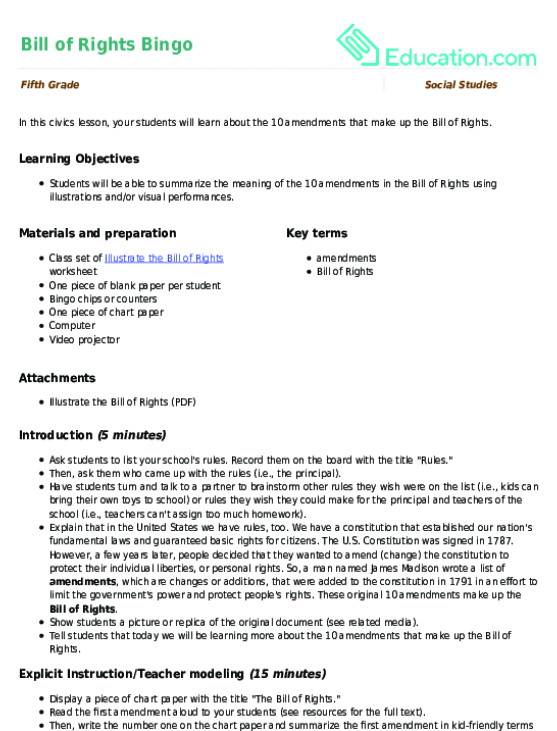 VIDEO:"The Bill of Rights Song"
Students will be able to summarize the meaning of the 10 amendments in the Bill of Rights using illustrations and/or visual performance. Ask students to list your school's rules. Record them on the board with the title "Rules." Then, ask them who came up with the rules (i.e., the principal). Have students turn and talk to a partner to brainstorm other rules they wish were on the list (i.e., kids can bring their own toys to school) or rules they wish they could make for the principal and teachers of the school (i.e., teachers can't assign too much homework). Explain that in the United States we have rules, too. We have a constitution that established our nation's fundamental laws and guaranteed basic rights for citizens. The U.S. Constitution was signed in 1787. However, a few years later, people decided that they wanted to amend (change) the constitution to protect their individual liberties, or personal rights. So, a man named James Madison wrote a list of Amendments, which are changes or additions, that were added to the constitution in 1791 in an effort to limit the government's power and protect people's rights. These original 10 amendments make up the Bill of Rights. Show students a picture or replica of the original document (see related media). Tell students that today we will be learning more about the 10 amendments that make up the Bill of Rights. 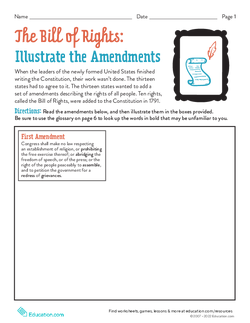 Display a piece of chart paper with the title "The Bill of Rights." Read the first amendment aloud to your students (see resources for the full text). Then, write the number one on the chart paper and summarize the first amendment in kid-friendly terms (see resources for simplified Bill of Rights). Continue reading the full text aloud and writing a summarized version for each of the 10 amendments. 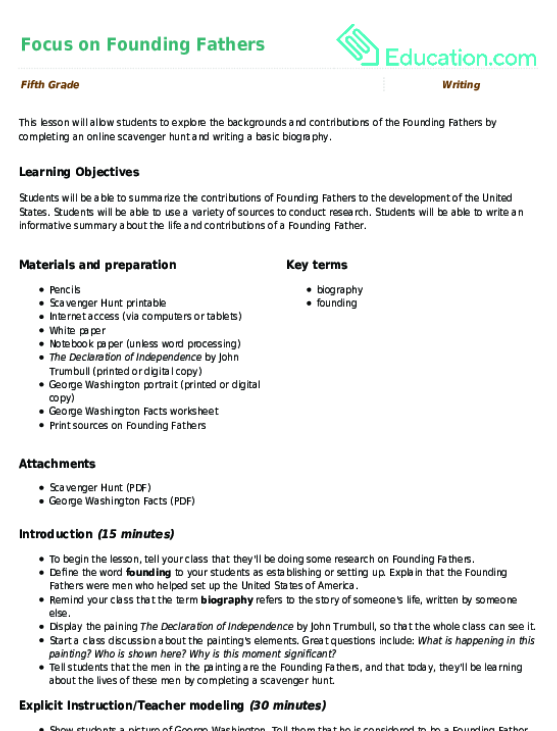 Keep the summarized Bill of Rights displayed for the duration of the lesson. Hand out one blank sheet of paper to each student and instruct them to fold it into 12 squares (three squares by four squares). Model the folding if needed. Instruct students to label each square with a number one through 10. Tell them that the numbers do not have to be in any particular order and can be mixed up in any way they want. Have students label two squares as "free spaces." Tell students that you will be reading amendments from the Bill of Rights out loud. When they hear an amendment, they should place a counter on the square with the number that aligns with that amendment. Explain that, if they fill one whole row or column with counters, they should shout "Bill of Rights!" Continue reading amendments until a student shouts "Bill of Rights!" to win the game. Hand out the Illustrate the Bill of Rights worksheet to each student. Instruct students to draw a picture to show the meaning of each of the amendments in the Bill of Rights. Invite students to share with a partner or small group when they are finished. 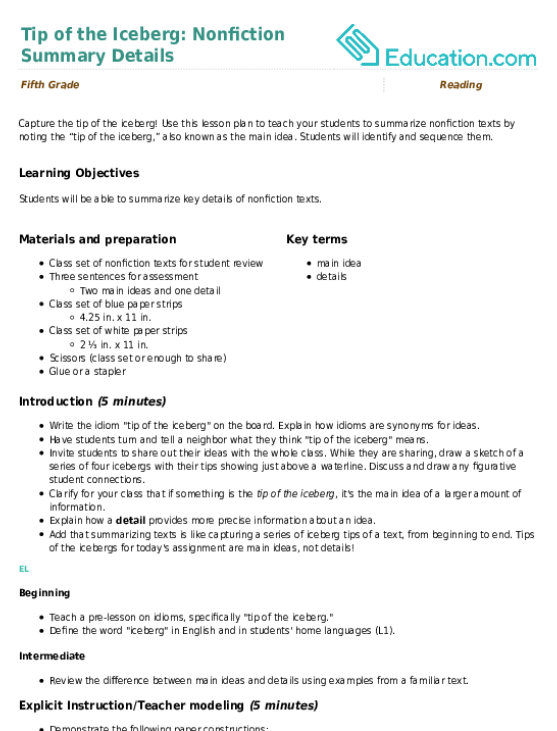 Draw symbols to go with the summarized amendments during the explicit teaching portion of the lesson. If your students are not familiar with the Constitution, teach a lesson about it before introducing the Bill of Rights. Have students count off into 10 groups. Assign each group an amendment from the Bill of Rights and instruct them to make a poster about it. They should include a picture and write the amendment in their own words on the poster. Display the posters together with the title "The Bill of Rights." Split students into 10 small groups. Assign each group one of the amendments from the Bill of Rights. Have each group create a skit or tableau showing the amendment they were assigned. Give each group a chance to perform. Ask the students in the audience to identify which amendment is represented in each performance. Show a video reviewing the Bill of Rights (see related media). Capture the tip of the iceberg! 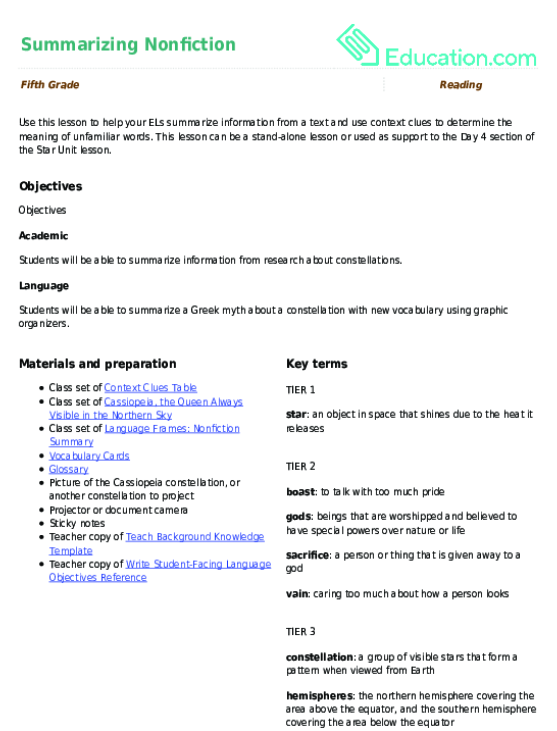 Use this lesson plan to teach your students to summarize nonfiction texts by noting the “tip of the iceberg,” also known as the main idea.